I was in the process of developing Kite Coach; rethinking group-based school concepts to start my own business, focused primarily on 1-on-1 sessions. When I saw his bike parked on the sidewalk, something in my brain just snapped into place. I met him a couple of days later and he told me his origin story, which really resonated with my own. Remco was working as a physiotherapist at a large care institution. The assembly-line-like working conditions failed to give him any sense of fulfilment and caused him a lot of stress. So, he decided to quit his job to start his own business: E-Fysio. 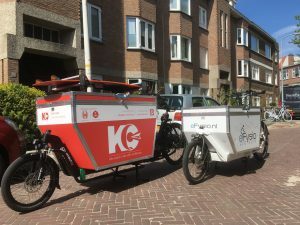 By using a Cargo Bike, he’s able to visit his clients in the comfort of their own homes and provide care on a much more personal level. More importantly, clients don’t have the trouble of having to travel to a clinic and back with their injuries. This physiotherapy concept actually makes a whole lot of more sense, right? 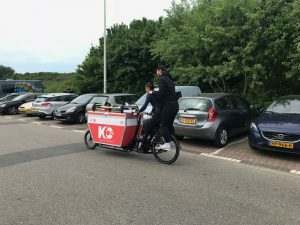 Are you in need of some physiotherapy and you live in The Hague, check out this Cargo Bike based concept at www.efysio.nl. Being Carge bike based, means I’m able to move quickly along the North Sea shoreline. I can do a beginner sessions in the morning at the Zandmotor, pack up my gear and move to a more quiet, open sea spot Zuiderstrand in the afternoon to do an advanced lesson. One of the biggest advantages of the bike, is that instead of parking at the parking lot, I’m able to go straight to the beach entrance with all the necessary gear and 1 passenger. This means that we skip the walk from the parking lot, carrying all the gear to the spot. This comes down to half an hour that you can now spend learning & riding. Sometimes, concepts look good on paper, but in reality fail to add any actual value. With Kite Coach, it turned out quite the opposite. This bike is a gift that keeps on giving! Your Kite Coach is also flexible when in comes to time. Schools have a fixed schedule for group lessons. These lessons take much longer than private sessions (up t0o 4 hours) and they have a specific start and end time. Planning for schools is a complicated affair! There are so many factors that have to be taken into account when planning a session, for starters: ever-changing weather conditions, but also students’ availability and riding level, instructor’s availability, gear, etc. Long story short: focussing on private sessions not only increases the quality and safety, but it also makes the booking process a lot less complicated. We ride before you go to work or after, or after you’ve taken the kids to school. I have kites down to 5 square meters and short lines, so I’ll even teach your kids when school’s out. Your Kite Coach is flexible!